Nearly there, the shopping center is already in sight in this view of Mülheim’s upper Schloßstrasse. The street is, of course, called like this because if you go all the way west over the Schloßbrücke, you end up at the medieval castle of Schloß Broich, which I’ll have to show at another time. 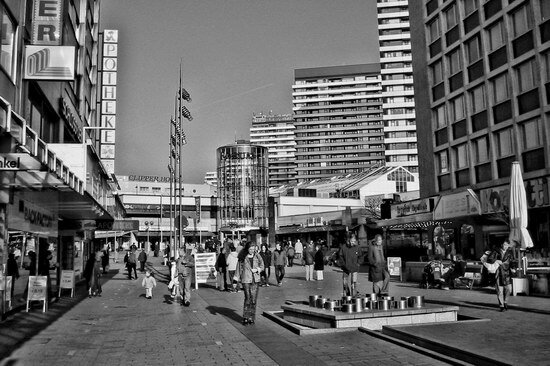 Before the Schloßstraße was remodeled at one time in the 1980s, a street used to go through the square in front of the shopping center, which now runs through a tunnel beneath it. I still remember waiting at the streetlights to cross this busy street in my childhood! It’s much safer for pedestrians now, but it’s not a real beauty – I’ll tell you tomorrow what we call this square in another photo..